The Census Bureau has proposed dropping a series of questions about marriage and divorce from its largest household survey of Americans, touching off a debate about the usefulness of such data. Since 2008, the bureau’s American Community Survey has asked a subset of the U.S. population about their relationship status, including whether they have been married, widowed or divorced within the past year. The survey also asks how many times a person has been married and when he or she last got married, which can be used to look at marital stability. The bureau proposed eliminating these questions, and two others, in part because it is under pressure from Congress to justify every question on the survey, which some political conservatives would like to eliminate because they say that it invades people’s privacy. But two vocal groups — academic researchers and some conservative advocates for heterosexual marriage — say it is important to have the data in an era when marriage is declining. The proposal is open for public comment through Dec. 30. The agency will then review the feedback and send a recommendation to the Office of Management and Budget, which makes the final decision. Any changes would take effect in 2016. The American Community Survey, which goes to more than 2 million households a year, produces annually updated demographic, social, economic and housing estimates for the nation, down to local neighborhoods. The numbers help guide the distribution of more than $416 billion in federal funds, and are widely used by government officials, businesses, researchers and advocacy groups. Several population research groups have mounted a protest campaign to keep the marriage questions, urging social scientists and others to tell the bureau the survey data are critical to studying broader demographic trends about American family structure. They say that survey estimates offer the nation’s only reliable and timely numbers on marriage and divorce trends because records from states — the other major source of data — are incomplete. The Association of Population Centers, National Council on Family Relations and the Council on Contemporary Families also are against deleting the questions. Recent research using the survey’s marriage and divorce data included a highly cited paper on the rise in divorce rates among older couples, and work by many analysts showing how marriage rates and stability are highest for highly educated Americans. Pew Research Center reports have used the survey data to look at how many Americans have been married more than once, and to explore recent trends in intermarriage by race and ethnic group. In addition to the Census Bureau data, marriage and divorce counts from states are published by another government agency, the National Center for Health Statistics, but the center stopped collecting detailed records in 1996. State records often lack details about age, race, income, education or other factors that researchers use to analyze which groups are most likely to wed or divorce. 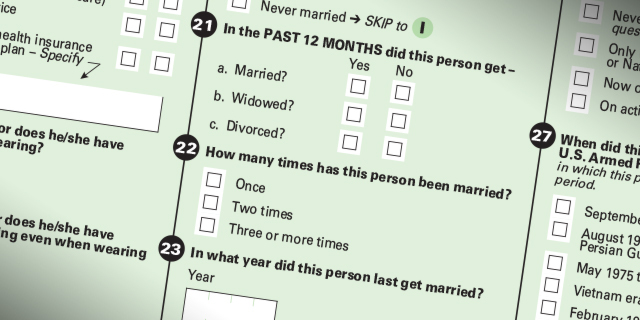 The U.S. Department of Health and Human Services, which houses the health statistics center, asked the Census Bureau to add marriage and divorce questions to its survey to fill that void. Marital status is not the only subject that the agency proposed to lose. The bureau also proposed dropping a question about home offices and another asking college graduates about their undergraduate major. Researchers have used the so-called “field of degree” question to track the nation’s science and technology workforce, and to analyze earnings and unemployment rates for graduates with different college majors. Both the National Science Foundation and Georgetown University’s Center on Education and the Workforce oppose deleting that question from the survey. The proposals to drop the marriage, home office and college-major questions were the result of a formal evaluation the Census Bureau launched this year of the costs and benefits of each one of the survey’s 72 questions, in part to respond to critics. Bureau officials said their review found that 54% of questions on the survey had high benefit to government agencies but low cost to respondents. Another 26% had high benefit and high cost; 17% (including the marriage and divorce questions) had low benefit and low cost; and 3% had low benefit and high cost. The bureau’s evaluation of the benefits of the marriage questions found that few federal agencies use data from them, and no uses were legally required. The most important use is by the Social Security Administration, which incorporates the data into state-level demographic forecasts. However, the bureau also concluded the questions were not difficult to answer, and only one — about multiple marriages — was a sensitive topic for respondents. James Treat, division chief of the bureau’s American Community Survey office, said in an email that the bureau received “a relatively low number of complaints” about the questions. The bureau’s evaluation of the benefit of each question was based on asking other federal agencies how they use the survey data, giving top priority to uses required by federal law, regulation or court rulings. The evaluation of costs was based on a bureau study of the mental effort required to answer each question, the sensitivity of topics they asked about and other measures of difficulty for respondents. When bureau officials announced their review, they emphasized that they would look at some of the touchiest question topics — such as whether one’s home has indoor plumbing, Americans’ commuting habits, income and disabilities. However, all scored very high on legally required federal uses, Census Bureau official Gary Chappell told a webinar sponsored by the American Community Survey Users Group. Questions about Americans’ commuting habits and income scored low on some measures of difficulty for respondents and high on others.